In a lawsuit filed Tuesday, Texas Attorney General Ken Paxton accuses U.S. agencies of violating federal law by failing to license a nuclear waste repository in Nevada. Texas is trying to take the federal government to task for failing to find a permanent disposal site for thousands of metric tons of radioactive waste piling up at nuclear reactor sites across the country. 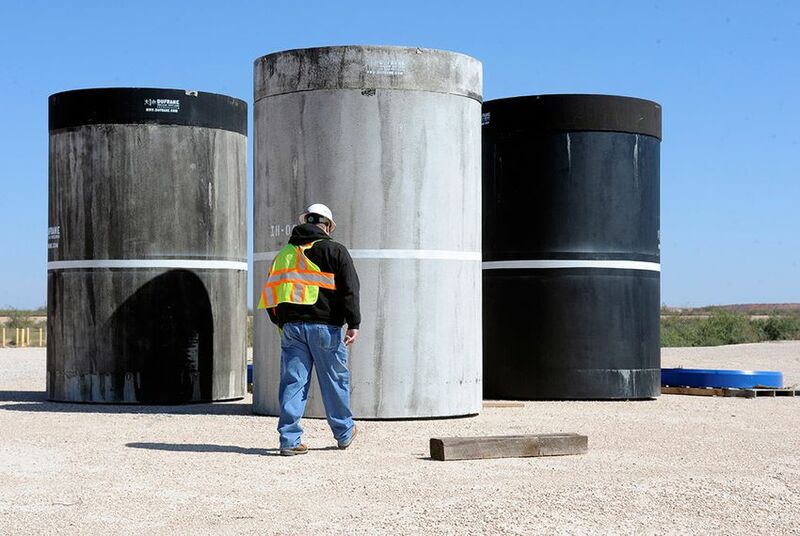 In a lawsuit filed Tuesday night, Texas Attorney General Ken Paxton accuses U.S. agencies of violating federal law by failing to license a nuclear waste repository in Nevada — a plan delayed for decades amid a highly politicized fight. Paxton’s petition asks the U.S. Court of Appeals for the 5th Circuit to force the Nuclear Regulatory Committee to cast an up-or-down vote on the Yucca Mountain plan. It also seeks to prevent the federal Department of Energy from spending billions of dollars in fees collected from utilities on efforts to find another disposal site before such a vote. Paxton filed the lawsuit just two weeks after former Texas Gov. Rick Perry was sworn in as the agency’s leader. And it comes as Texas’ only radioactive waste site — run by Waste Control Specialists in Andrews County — is asking the NRC to let it temporarily store the nation’s spent nuclear fuel. About 78,000 metric tons of spent uranium rods are stored at operating or closed reactor sites throughout the country, with 2,610 metric tons in Texas. Those sites, mostly meant to be temporary, are filling up. For more than 20 years, Washington saw Yucca Mountain as the solution, and the federal government spent tens of millions of dollars preparing it to accept the waste. But Nevada’s congressional delegation — led by now-retired U.S. Sen. Harry Reid, a Democrat — has thwarted the project. And, facing significant political pressure, President Barack Obama’s administration abandoned the Yucca Mountain plans by failing to fund an NRC review. Since 1983, utility ratepayers across the country chipped in billions of dollars to fund a waste repository — including $815 million collected from Texans. With interest, Texans have contributed $1.5 billion to the fund, managed by the Department of Energy. A Perry spokesman did not immediately respond to an emailed request for comment. During Perry’s tenure as governor, Texas became home to one of the nation’s few facilities that accept low-level nuclear waste. Since 2012, Waste Control Specialists, a company formerly owned by the late Dallas billionaire and Republican donor Harold Simmons, has disposed of contaminated tools, building materials and protective clothing, among other items, from shuttered reactors and hospitals. That site in Andrews County grew rapidly during Perry’s final years in office. Over the objection of environmental groups, the company is seeking a license to temporarily store spent reactor fuel — high-level nuclear waste. If Paxton’s suit does not force President Donald Trump’s administration to restart the Yucca Mountain plans, some observers say the federal government might more closely eye the Andrews County site — a move that would require Congress to change that 1987 law naming Yucca Mountain as the nation’s repository. Asked whether Paxton’s lawsuit had anything to do with Waste Control Specialists’ expansion plans, Kayleigh Lovvorn, his spokeswoman, said her office had no comment. Karen Hadden, executive director of the Sustainable Energy and Economic Development Coalition, a group fighting the Andrews County site’s expansion, agreed with Paxton’s criticism of the Yucca Mountain process — “a waste of money,” she said. But Hadden worries that the lawsuit could force the government to permit a site ill-equipped to protect public health and safety. Disclosure: The Harold Simmons Foundation and the University of Texas at Austin have been financial supporters of The Texas Tribune. A complete list of Tribune donors and sponsors can be viewed here.